This article has been corrected. See Corrigendum to: The Effects of Insulin-Like Growth Factor-1 Gene Therapy and Cell Transplantation on Rat Acute Wound Model. To Cite: Talebpour Amiri F, Fadaei Fathabadi F, Mahmoudi Rad M, Piryae A, Ghasemi A, et al. The Effects of Insulin-Like Growth Factor-1 Gene Therapy and Cell Transplantation on Rat Acute Wound Model, Iran Red Crescent Med J. 2014 ; 16(10):e16323. doi: 10.5812/ircmj.16323. Background: Wound healing is a complex process. Different types of skin cells, extracellular matrix and variety of growth factors are involved in wound healing. The use of recombinant growth factors in researches and production of skin substitutes are still a challenge. Objectives: Much research has been done on the effects of gene therapy and cell therapy on wound healing. In this experimental study, the effect of insulin-like growth factor (IGF-1) gene transfer in fibroblast cells was assessed on acute dermal wound healing. Materials and Methods: Fibroblasts were cultured and transfected with IGF-1. Lipofectamine 2000 was used as a reagent of transfection. Transgene expression levels were measured by the enzyme linked immunosorbent assay (ELISA). To study in vivo, rats (weighing 170-200 g) were randomly divided into three groups (five/group) and full-thickness wounds were created on the dorsum region. Suspensions of transfected fibroblast cells were injected into the wound and were compared with wounds treated with native fibroblast cells and normal saline. For the microscopic examination, biopsy was performed on day seven. Results: In vitro, the maximum expression of IGF1 (96.95 pg/mL) in transfected fibroblast cells was 24 hours after gene transfer. In vivo, it was clear that IGF-1 gene therapy caused an increase in the number of keratinocyte cells during the wound healing process (mean of group A vs. group B with P value = 0.01, mean of group A vs. group C with P value = 0.000). 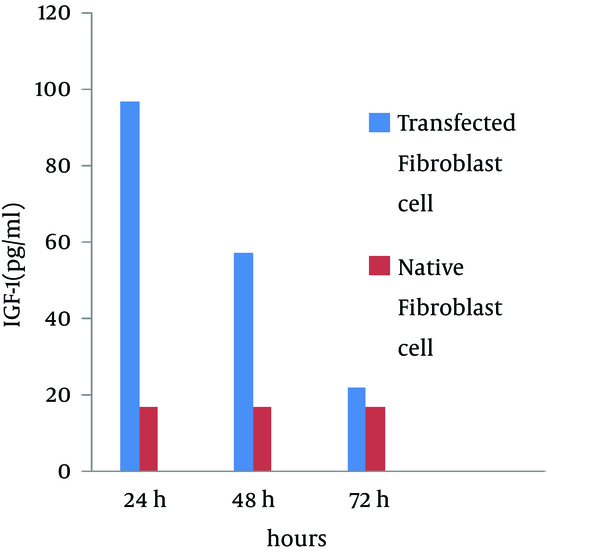 Granulation of tissue formation in the transfected fibroblast group was more organized when compared with the normal saline group and native fibroblast cells. Conclusions: This study indicated that the optimization of gene transfer increases the expression of IGF-1. High concentrations of IGF-1, in combination with cell therapy, have a significant effect on wound healing. Full-thickness wounds, as one of the main issues in medicine, cause significant morbidity and mortality. There have been several reported complications because of delay in wound closure (1). Thus, rapid wound closure seems to be a necessary factor in wound healing and patient recovery (2, 3). Today, for improving the wound healing processes, cultured epithelial autografts (CEAs) are directly transplanted to full-thickness wounds (4, 5). Wound healing as an intricate and dynamic process includes three sequential overlapping phases. These phases are as follows: inflammatory, proliferative and remodeling (6). Many potential agents, such as blood cells, parenchymal cells, extracellular matrix and growth factors participate in the wound healing process (7-9). Fibroblast cells as the main cell of connective tissue are almost involved in the entire wound healing process. They do their roles by producing collagen fibers during the proliferation phase of wound healing (10). Today, many studies on wound treatment have been done to improve the wound healing process. Cell therapy, the transfer of cells to injured skin, is one of the treatment options, which has been considered by previous studies. Cell therapy is a new clinical method, which is used in medicine for repair of damaged tissue. In this method, autologous fibroblasts and autologous keratinocytes are used for the treatment of full-thickness wounds (11, 12). Herein, the fibroblast cells, as signaling cells, produce growth factors, which are necessary for connecting all cells with each other during the wound healing process (13-15). It has been revealed that the IGF-1, produced by fibroblast and other epithelial cells, has an important role in re-epithelialization and granulation tissue formation of epidermal tissue during wound healing processes (6, 10, 16, 17). Despite the low levels of IGF-1 in dermal and granular layers of normal skin, this amount is more significant in damaged skin layers (18). Previous studies on experimental skin wound models showed that the amount of IGF-1 is significantly increased during wound healing processes (17-19). The expression of proteins and mRNA IGF-1, were significantly decreased in diabetic patients (18, 20-22). These decreases in expression of mRNA and proteins IGF-1, which led to the prolongation of wound healing processes, are one of the main concerns of diabetic patients (23). In the study conducted by Kratz et al. in 1992, it was shown that IGF-1 has a major role in the proliferation of fibroblasts and keratinocytes in the skin (24). Due to the short lifetime of growth factors, the efficiency of their use is still very low in wound healing (25). Additionally, it has been shown that many growth factors have positive effects on chronic and acute wound healing in diabetic and non-diabetic patients (26). Therefore, it seems that the transfer of the gene encoding the growth factor involved in re-epithelialization will be helpful and effective. The transfer of IGF-1 gene and protein, as well as other genes directly into the wound location has previously been investigated by others (16, 27). Thus, we aimed to study the in vivo effects of cell therapy and gene therapy on acute wound healing by transferring IGF-1 genes into fibroblast cells and transplanting them to acute wound models in rats. The hair of the abdominal region was shaved and the skin was thoroughly disinfected. A small piece of full thickness skin grafts measuring 2 × 2 cm was harvested by a scalpel. The created wounds were covered with Vaseline gauze and sterile bandages. The samples were placed in Dulbecco's Modified Eagle Medium (DMEM, Gibco, Cat.No.31966021) supplemented with 10% fetal bovine serum (FBS) (Invitrogen) and 10% penicillin/streptomycin (Sigma), and transferred to the culture room. All dermis separation steps were done using sterile material and reagents, under a laminar hood. Skin samples were washed once by 70% ethanol and phosphate buffered saline (PBS) three times. Next, the dermis part of skin samples were separated from the epidermis using 0.25% Trypsin-EDTA (1X) (Gibco®). The obtained dermis samples were cut into smaller than 1 mm pieces by sterile scissors and explanted to a 100 mm tissue culture dish (Corning®) with complete Dulbecco's Modified Eagle's medium (DMEM) supplemented with 10% FBS, 1% penicillin/streptomycin and incubated at 37°C with 5% CO2. Cultivated cells were fed every three days. After multiplication of cells to 85-95% confluence, they were harvested by trypsinization. The obtained suspension was centrifuged and the fibroblasts were subcultured in a new cell culture flask (CELLSTAR®). The subcultured cells in the fifth passage were preserved at -80°C. Lipofectamine 2000 (Invitrogen-Cat. No. 11668-027) was used as a transfection reagent. For harvesting transfected cells with high efficiency and low cytotoxicity, the optimizing of transfection methods by different concentration of DNA, cell density and lipofectamine 2000 was necessary. For this purpose, the cells were transfected by two methods: reverse and direct transfection. Transfection was performed at ratios of 1: 1.5, 1: 2, 1: 3, 1: 4, 1: 5, 1: 6, 1: 7 and 1: 8, DNA (in µg): lipofectamine 2000 (in µL). The fifth passage of fibroblasts at a density of 4 × 104 was seeded and cultured in a 96-well plate. When the cultured cells were proliferated to 85-95% confluence, they were transfected by 0.2 µg of IGF1 (NM-001082477) rat cDNA clone (Origene, Cat No. RN200508)/lipofectamine 2000 at different ratios. The complex was placed in serum-free medium, added to the cells, and incubated at 37°C and 5% CO2 for 4-6 hours. Then the transfection mixture was replaced with regular growth medium. The medium was collected 24 hours, 48 hours and 72 hours later for quantitative analysis of IGF-1 expression. In order to measure IGF-1 protein levels produced by transfected and untransfected fibroblast cells in vitro, the culture supernatants were examined by the ELISA test. Samples were detected according to the manufacturer’s instructions for IGF-1 using the Quantikine ELISA Mouse/Rat IGF-1 Immunoassay kit (R and D Systems, Cat. No. MG100). 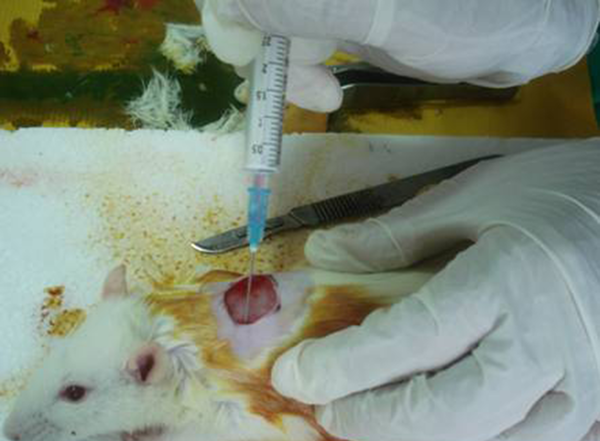 For creating full-thickness skin wounds, the rats were anesthetized by intramuscular injection of ketamine (50 mg/kg) and xylazine (5 mg/kg) to prevent pain and suffering. The skin in the dorsum region was then shaved and thoroughly disinfected. Under sterile conditions, a square-like skin incision, measuring 1.5 × 1.5 cm, comprised of a full-thickness skin layer down to the panniculus carnosus muscle was created on the dorsum, using a scalpel blade. After reaching 85-95% confluence of the fibroblasts fifth passage, half of them were transfected. After cell count, using the trypan blue exclusion test, the cells were transferred into two individual syringes with serum and antibiotic free DMEM (one per group) and transferred to the operation theater. In groups A and B, the transfected and untransfected cells were re-suspended and injected intradermally around the wound at four different sites (Figure 1). In group C, normal saline (NS) solution with same volume was injected. After the operation, the rats were kept in separate cages. The skin tissue samples derived by biopsy were examined for pathohistological changes with a small excision containing part of the wound area and normal area. Tissues were fixed in 10% formalin. Paraffin-embedded sections (5 μm thick) were serially prepared with a 15 μm interval between each consecutive section and stained with hematoxylin and eosin. The characters of tissue repair including: epithelialization, granulation tissue formation, severity of inflammation in healed areas was evaluated by a blinded pathologist. The numbers of fibroblasts, keratinocyte and neutrophil cells were counted with the Bio report OLYSIA Soft Imaging System GmbH, version 3.2 (Build 670). Data were evaluated using the SPSS version 15 and all data were expressed as ANOVA, One-Way ANOVA and Tukey tests. Significant differences were calculated between the groups. Significance was accepted at P < 0.05. After separating the desired dermis from the abdominal part of rats and cultivating them in the culture plates, the fibroblasts began to migrate and grow radially around the cultured dermis. These growths were especially remarkable during the first 72 hours of cultivation. These cultivated fibroblast cells multiplied to 90-95% of confluence after 19 days of culture (Figure 2). In the current study, fibroblast cells at density of about 5 × 105 from the fifth passage were cultured in flasks (T-75). After multiplication of cells to 90-95% confluence, they were transfected at ratio of 1 to 5 by 0.2 μg of IGF1 (NM-001082477) rat cDNA clone (Origene, Cat No. RN200508) complex with lipofectamine 2000 (Invitrogen-Cat. No. 11668-027) in 96-well plates. To optimize the transfection method, different concentrations of reagents were used by both direct and reverse methods. The results showed that the IGF1 expression via the reverse method was more than the direct method. We suggest that the use of 0.2 µg IGF-1 with 1 µL lipofectamine 2000 in the reverse method after 24 hours causes a significant increase in IGF-1 expression of fibroblasts (approximately 5.7 fold (96.95 pg/mL)) in comparison to the control groups (16.9 pg/mL) while at 48 and 72 hours after transfection, this rate was gradually reduced (3.4-time and 1.3-time, respectively) (Figure 3). Twenty-four hours after transfection of cells, the suspensions containing the native and transfected cells were transplanted to full thickness wounds. The healing process of the wounds was evaluated after seven days. In the experimental groups, the wound contracture, increase of content density and concentration and drying of the wounds were observed on the second day after transplantation, while, in the control group they were observed on the third and fourth day after transplantation (Figure 4). The results indicated that wound healing in terms of time was faster in the gene therapy group in comparison to the groups that received the native cells and normal saline. Hair growth was also observed in the wound healing area. During a biopsy of healed area for histological evaluation, the abnormal and tightening fibrous tissue was well respected in the wound healing area of the control group. A: Wounds treated with transfected fibroblast cells. B; Wounds treated with native fibroblast cells. C; Wounds treated with normal saline. Seven days after the operation, a sample biopsy was taken from the wound area. The effects of gene and cell therapy on quantitative indexes of wound healing are presented in Table 1.
a Data are presented as Mean ± SD and P value. b Data are presented in 40 × 10 magnification. c Wounds treated with transfected fibroblasts (n = 5). d Wounds treated with native fibroblasts (n = 5). e Wounds treated with normal saline solution (n = 5). Pathohistological assessment of the wound biopsy showed that wound epithelialization was achieved completely in the gene therapy group without any significant clinical signs, inflammation or epithelial defects. Moreover, a newly formed epithelium with rather well organized layers was observed. Comparative light microscope analysis proved that the population of fibroblast cells in this group was more than the control group. Additionally, the granulation tissue was denser, more fibrotic and less acute (Figure 5 A). In the treated wounds by native cells, the keratinocyte cells were in the migration phase from the edge to the center of wounds, and the newly formed epithelium were less organized in comparison with the gene therapy group (Figure 5 B). The normal saline groups showed a significant reduction in the number of fibroblast and keratinocyte cells and significant increase in neutrophils in comparison with the other groups (Figure 5 C). The black arrows indicate the extent of the formed new epithelium. The red arrows indicate the ulcer area. A: Histology of wounds treated with transfected allogeneic fibroblasts with the IGF-1 gene (without ulcer). B: Wounds treated with native fibroblasts. C: Wounds treated with normal saline. (H and E staining; 4 × 10 magnification). Although great advances in recent years have been seen in gene transfer to tissue, it is difficult to achieve high concentrations of transgene in vivo. Successful gene transfer, specifically in skin, is still a challenge; high levels of gene expression in order to obtain the correct concentration in wound healing is vital (28). Thus, we evaluated and optimized non-viral gene transfer in allogeneic fibroblast cells and measured the expression of IGF-1 in vitro. Lipofectamine 2000 as a transfection reagent with high transgene expression was mixed with the cDNA. We found that the ratio of 1 to 5 for cDNA/Lipofectamine 2000, with a cell density of 4 × 104 has high efficiency in transfection. Finally, in vitro, IGF-1 transgene expression reached 96.95 pg/mL after 24 hours. The beneficial effects of transplantation of fibroblast and keratinocyte cell suspension were demonstrated in wound healing (12). Fibroblasts produce many cytokines and growth factors, which stimulate the proliferation and differentiation of cells in the wound bed (29). Also, a number of researchers have reported that wound healing, with skin substitutes containing living cells, occurs faster, better and with less fibrosis (12). In the present study, wounds treated with allogeneic fibroblasts compared with wounds treated with normal saline, showed significant improvement in epidermal repair. Therefore, it is necessary to always have available cultured cells for the treatment of wounds in the clinic. Fibroblasts have a critical role in the proliferation phase of acute wound healing. They migrate into the wound and synthesize collagen and other essential proteins for the extracellular matrix (30). Unlike some researchers (12), Svensjo et al. showed that injection of autologous fibroblasts into the wounds of healthy pigs has little effect and suggested that exogenous fibroblasts are not involved in the promotion of wound healing (11). However, our results showed that allogeneic fibroblasts culture might play a role in increasing epidermal thickness. Growth factors play an important role in the wound healing process. Moreover, a decrease in the concentration of growth factors in diabetic wounds has been observed and abnormal concentrations of growth factors are thought to have an effect on the wound-healing cascade (15, 31, 32). Due to the low lifetime of growth factors in the wound environment (25, 33), gene therapy along side cell therapy is important. With IGF-1 gene transfer, expression of growth factors and type 4 collagen increases and epithelialization is facilitated. Exogenous IGF-1 gene, as well as the endogenous, has a similar intracellular response (16). IGF-1 in plasma (circulating) does not play a role in wound healing and local IGF1 plays a very effective role in the healing process (16). Gene therapy is a technique that is used today for healing and tissue regeneration. Gene transfer to cells and then cell transplantation in the wound, reduces the need for re-transplantation of cells and thus reduces the cost of treatment. It has been shown that IGF-1 enhances keratinocyte cell migration on ECM (Extracellular matrix) proteins (34). We found that with transient transfection of allogeneic fibroblasts and 5.7-fold IGF-1 gene expression in fibroblast cells and then transplantion into the wound, the epidermal thickness significantly increased, compared to wounds treated with native fibroblasts and normal saline. Transfected fibroblasts increased the number of fibroblasts in the ECM, which accelerated wound healing. Histopathological examinations of microscopic slides revealed that the wounds treated with transfected fibroblasts had fewer inflammatory cells, compared to the other two groups. In our study, the extent of lesions and microscopic examination indicated efficacy of gene therapy and cell therapy in the treatment of wounds. In addition, fibroblasts, such as keratinocytes, are an effective vehicle for gene transfer in the wound environment (23). In this experiment it was evident that transfected fibroblast cells with higher expression are more effective in facilitating healing compared to native fibroblast cells with lower expression. Our results indicate that IGF-1 gene therapy with cell therapy facilitates wound healing and shortens recovery time. To achieve better valuable statistical results in association with cell therapy and gene therapy, studies need to be performed on a larger sample of animals. Since the skin of the pig is physiologically more similar to humans (35) and also several wounds can be created on one animal model, thus research is recommended to be carried out on pigs. We wish to thank the Vice Chancellor of research of Mazandaran University of Medical Sciences, Sari, IR Iran and the Chancellor of research of Skin Research Center, Shahid Beheshti University of Medical Sciences, Tehran, IR Iran for their financial support. Authors’ Contributions: Mahnaz Mahmoudi Rad: conception and design of the experiments, analysis and interpretation of data, drafting of the article, revision and final approval of the version to be published. Fereshteh Talebpour Amiri: conception and design of the experiments, analysis and interpretation of data, drafting of the article, revision and final approval of the version to be published. Fatemeh Fadaei Fathabadi: acquisition of data, statistical analysis and interpretation of data, drafting and revising the article. Nariman Mosaffa: substantial contributions to conception and design of the experiments, acquisition, analysis and interpretation of the data, and drafting of the article and revision. Azar Ghasemi: as a pathologist she contributed to the study of microscopic slides. Abbas Piryae: as a histologist he contributed to the study of microscopic slides. Farshid Yeganeh: as an immunologist he assisted with the transformation and gene transfer to cells. Alireza Khalilian: statistical analysis and contribution to details. Funding/Support: This research was supported by research grants from Mazandaran University of Medical Sciences (Grant code: 91.51; date: 2012.8.17), Sari, IR Iran and Skin Research Center, Shahid Beheshti University of Medical Sciences, Tehran, IR Iran.